This month, the third set of pages of the Submarine Signaling book is posted, so the entire booklet is now online. Also, some photos from SC 259. One of these I hope to see in greater detail, as the devices on the bows of two chasers may be the elusive trailing wire reels. More on that, later, I hope. Enjoy the especially cold winter. The house is chilly, but at least it's not -14 degrees on a chaser frozen into the ice in New London! The third and last set of ten pages from the 1920 Submarine Signaling book is now online. It's a neat little booklet, well worth looking at. Some of these devices look almost like modern sculpture. 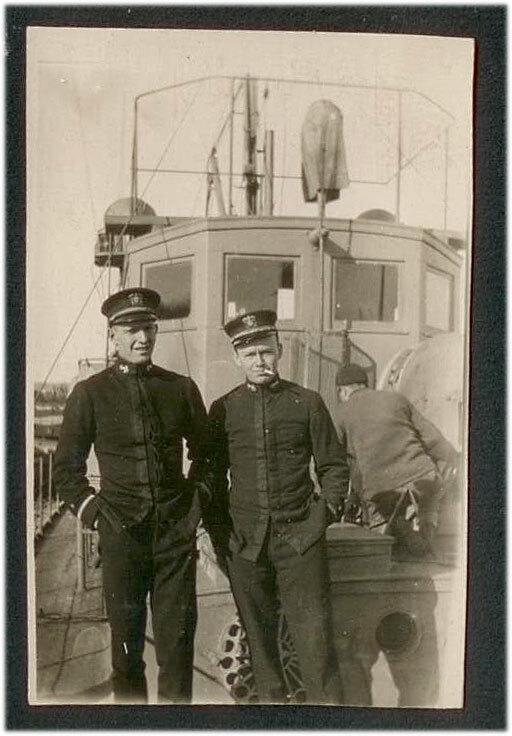 Recently posted is a set of crew photos from a crewman who served on SC 259, which was stationed at Plymouth, England during the war. This is one of the chasers that toured the area after the war, as the US Navy made an effort to sell some of the boats overseas instead of bringing them back to the US.